According to the emergency study, Antiy Labs has started to analysis and verify the attack components of the attack organization called Equation by our friend of business on February 18th, 2015. Then we set up the inter-departmental JAG (Joint Analysis Group) on February 25th and finished the first edition of this report on March 4th. The relevant background is as follows: Kaspersky Labs issued a series of reports on February 16th, which revealed the most complex network attack organization — Equation Group—that may exist in the world. According to Kaspersky Labs, the C&C used by this group has been registered in 1996, which indicates that this group might have been active for 20 years. As they can always find vulnerabilities earlier than other groups, they have had absolute advantages for years. The Group has a super standard information weapon arsenal, which includes two malware modules that can reprogram dozens of common brands of hard disk firmware. 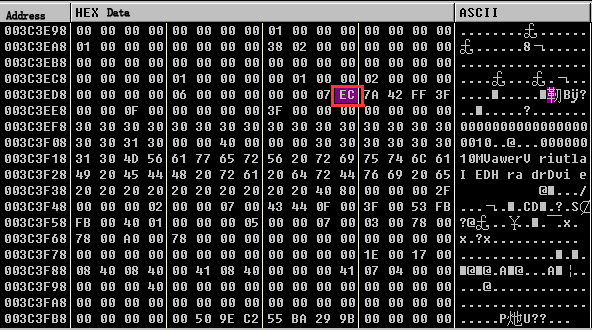 This might be the most characteristic attack weapon the Group possesses and the first known malware that can infect hard disk firmware. The reports of Kaspersky issued on February 17 and 19 have published the detail analysis result of 2 modules, which are Fanny and DoubleFantasy. According to the analysis of relevant clues, Kaspersky believes the attack targets include Russia, India, China and other countries. While the relevant media has concludes that this Group may be related to the intelligence agencies of America. In light of the complexity of samples and the unique characteristic of attacking hard disk firmware, our analysis progress is extremely slow. Now we share the limited analysis results in order to promote more and more participations and collaborations among our industry. Our report does not make more references and repeats on the contents that have been fully discussed in Kaspersky’s report. Therefore, readers are advised to read Kaspersky’s report in the first place, and then read this report to give valuable comments. The discovered arsenal of the Equation Group has at least 6 pieces of equipment: EquationLaser, EquationDrug, DoubleFantasy, TripleFantasy, Fanny and GrayFish. The engineers of Antiy Labs called them “components”. 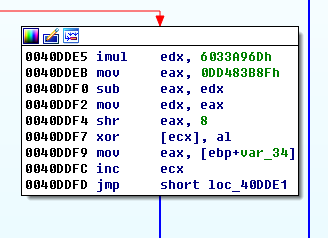 Except for these components, Kaspersky also provided other malware hashes that might be used by Equation. The corresponding programs include: EQUESTRE (being similar with EquationDrug), GROK keylogger, installation program of DoubleFantasy, LNK exploit program of _SD_IP_CF.dll and module nls_933w.dll that can reprogram the hard disk. The Equation Group selects Fanny or DoubleFantasy or TripleFantasy as the leading part of attack. When the Group confirms the expected targets, it would use more complex component EquationDrug or GrayFish. 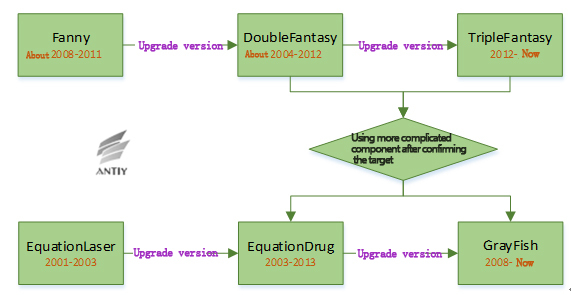 Currently, the analysis team of Antiy Labs focuses on the attack leading component (DoubleFantasy) and the more complex component (EquationDrug and GrayFish). Meanwhile, we analyze the component that can reprogram the hard disk firmware, namely nls_933w.dll. Component DoubleFantasy is used for confirming the attack target. If the target belongs to the field that the Equation Group is interested in, then other more complex components will be injected into the attacked machine from the remote points. 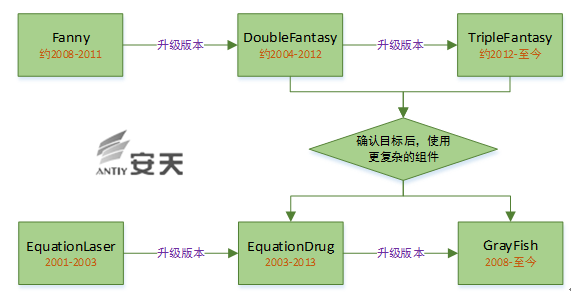 The Kaspersky’s report has analyzed DoubleFantasy in detail; the analysis team of Antiy Labs was going to verify DoubleFantasy. However, we have found that this component has been analyzed before during the verification process and found other relevant malware. Meanwhile, we also found the information that has not been revealed by our friend of business. Component DoubleFantasy enumerates the registry key to find out whether the system installs security software. The security software list is in the resource section and uses 0x79 XOR encryption. The Kaspersky’s report provided the security software list; there are 10 types in total. While the analysis team of Antiy Labs found this component detects 13 kinds of security software. Except for the 10 types of products, there are products of 360, BitDefender and Avira. Functionality: back on-line, initiating the communication key, deleting itself, clearing the infected traces. 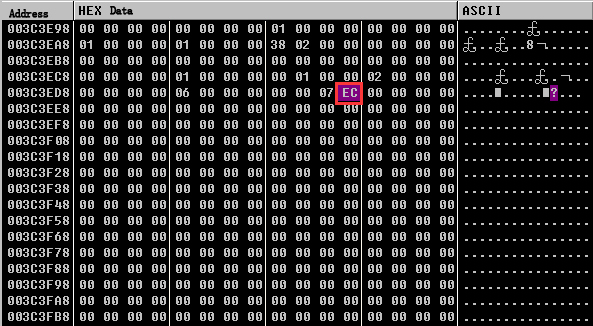 The pattern of the controlling end: the first byte is command code 0x42, the second byte is command branch that includes three types: 00 instant back on-line, 01 initiating the communication key, back on-line after sleeping 60 seconds, 02 deleting itself, clearing the infected traces. The returning package pattern of the controlled end: none. The Kaspersky’s report has provided the following information about the relevant components: version, C&C lists and keys. After further analysis, we have obtained more relevant information. The green parts in the following are from Kaspersky’s report, while the red (Bold) parts are the new information analyzed by Antiy Labs. Component DoubleFantasy is usually the first step of victims being infected by the Equation Group. It confirms the victim’s information through communicating with the backdoor and examining different system parameters. Once the victim is confirmed, the Equation Group would adopt the more complex components EquationDrug or Grayfish. Component EquationDrug is a very complex module. It has existed for nearly ten years and later been replaced by the GrayFish upgrading. We found in our analysis that some file names of the two modules share similarity; there are also some similar techniques in terms of obfuscation encryption. They decrypt, decompress and release files from the resources. We found SYS file and VXD file existed in the resource during our analysis. VXD is the driving mechanism on Windows 9x, so we firmly believe that this module has the capability of infecting Windows 9x. 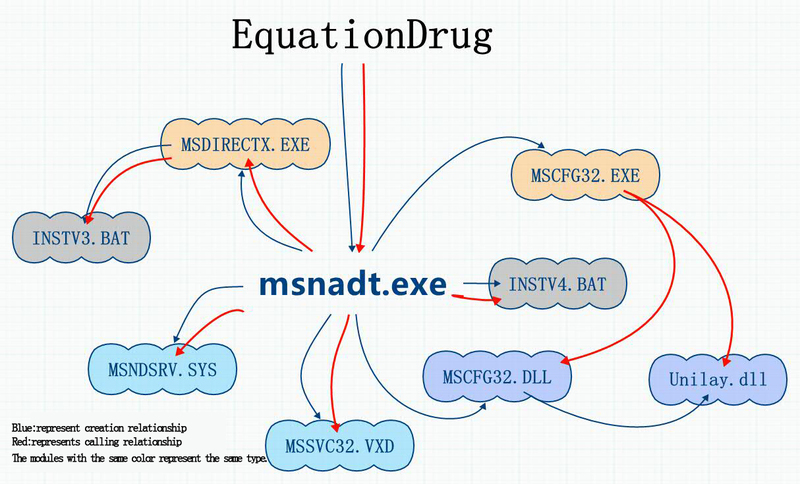 EquationDrug is a plug-in platform with the functionalities of installing and uninstalling the plug-ins. msnadt.exe The main functionalities are as follows: releasing files, decrypting resources, judging system types, injecting code into the specified process and downloading drives and so on. MSDIRECTX.EXE Setting up INSTV3.BAT and executing self-deleting. MSCFG32.exe Downloading MSCFG32.DLL, adding and modifying the registry. MSCFG32.DLL It can add and modify the registry, release unity.dll file. It has relationship with the driving files with networking functionality. unity.dll There are a large amount of file operations and registry operations. MSSVC32.VXD Sharing the same functionalities basically. VXD is used on Wndows9.x, which main functionalities are hook, network monitoring and writing files. It can also determine whether there is MSlog32.dat; if so, it would open to write data; if not, it would establish a new one. INSTV4.BAT Deleting files by itself. It enumerates the registry key to check whether the system installs security software. The security software list is under the resource chapter. It retrieved the entire network adapter during the drive initialization process. Then it called function NdisRegisterProtocol to registered a NDIS protocol related structure for NDIS base. Then the drive can receive all the network traffic, which is similar with package capture mechanism of WinPcap. The relevant code is as follows:Modifying the function address of KeServiceDescriptorTable. The modified function address only includes one JMP command. If the function in KeServiceDescriptorTable is not its hook target, it would return to the original function address, otherwise it would jump to the functions that drive itself. The address of nt!NtAcceptConnectPort in KeServiceDescriptorTable is 820742b1. 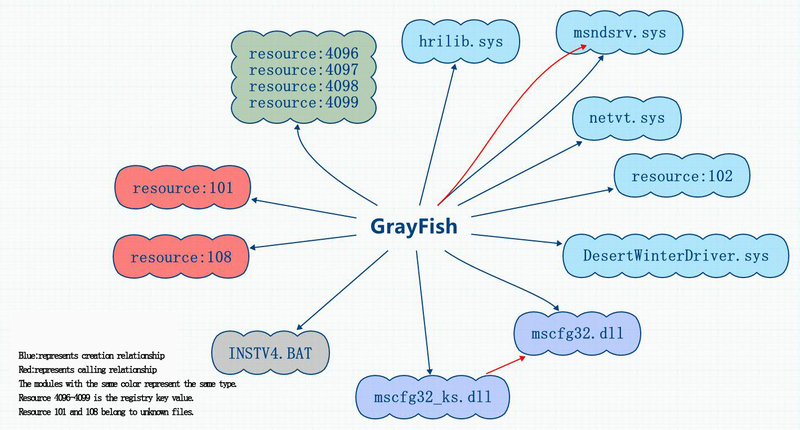 GrayFish is the most complex component of the Equation Group. It is the new version of EquationDrug. The most important characteristics we believe are: it does not depend on the file carrier, completely existing in the registry, executing by bootkit when system is enabling. This mechanism penetrated the limitation of security products of making files as detecting objects and the solutions based on whitelist and trusted computing. The resource section of component GrayFish includes 13 kinds of encryption resource, which are decrypted by the same paragraph decryption algorithm. The decrypted 13 files include five SYS files, two DLL files, four files with registry data, a configuration file with string “services.exe” and an encrypted data file. After dynamic debugging, it is found that three SYS files (hrilib.sys, msndsrv.sys and netvt.sys) were released by the original samples, including network drive and registry-related operation functions. 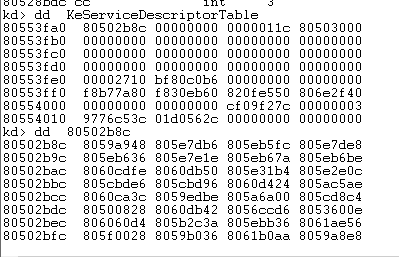 mscfg32_ks.dll, having the functionalities of establishing remote thread, accessing system information, establishing and deleting registry key, would call mscfg32.dll. Besides these three released SYS files, resource 102 contains the functions that operates the registry, while DesertWinterDriver.sys contains the comparisons with IoControlCode, the specific functionality is to be analyzed. Besides, the original sample would generate batch to delete itself. The batch file name is the same one that EquationDrug used to delete itself, which also indicates a close relationship between them. nls_933w.dll is the module that can reprogram hard disk firmware. As Antiy analysis team lacks the reserve knowledge of hard disk firmware field, the analysis is processing very slowly. According to current analysis, when module nls_933w.dll is called by other programs, it would release file win32m.sys which is responsible for communicating with hard disk controller. File win32m.sys can determine the types of hard disk controller and send corresponding control commands, such as IED, SATA and so on. Therefore, if the attackers are familiar with the ATA commands that different vendors specified, then they can carry out malicious tampering on hard disk firmware. 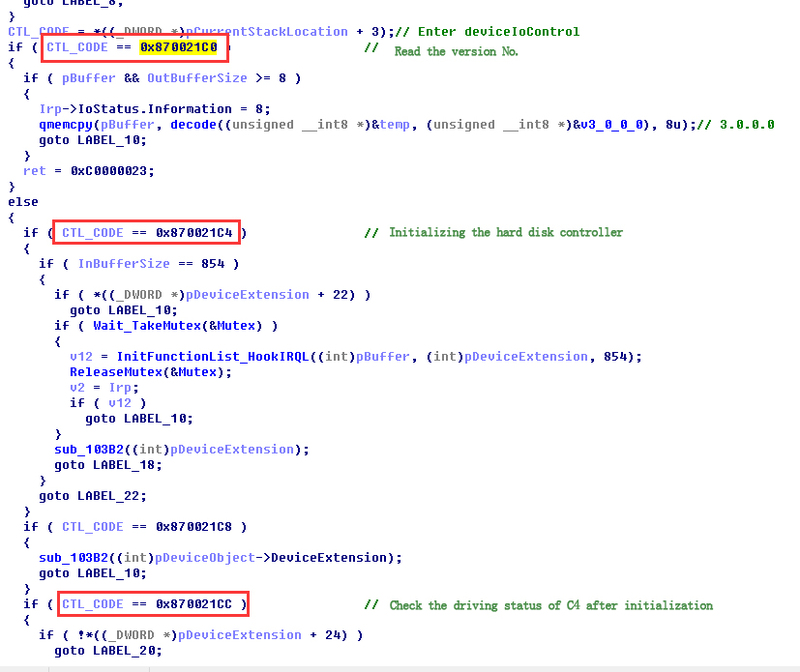 With the dynamic debugging operation, Antiy analysis team found that this module called the function DeviceIoControl to interact with win32m.sys. For the win32m.sys, the team found several IoControlCodes and analyzed their corresponding functions. Antiy team found that when IoControlCode was 0x870021D0, nls_933w.dll delivered ATA control command to hard disk controller, i.e. 0xEC , getting the related information about the hard disk. Other functions corresponding to the IoControlCode and ATA commands need to be further analyzed and found. 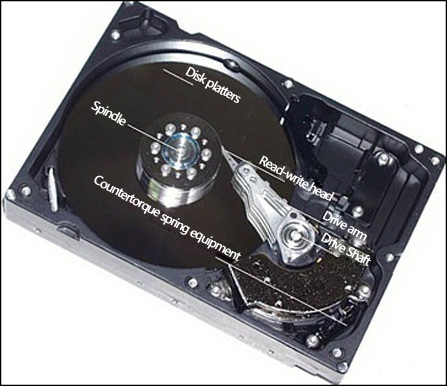 Whether the traditional mechanical hard disk or the solid state disk, they are similar on the structure. In terms of the mechanical hard disk, motor drive circuit and head control circuit, the hard disk is composed primarily of processor, cache, Boot ROM and main storage medium. Since there are CPU, memory and ROM on the circuit board, the hard disk can be considered as a small computer system, and implement its own actions under the control of the firmware. The current common hard disk’s processors are all based on the ARM core, while the multi-core structure is even adopted by new processors to ensure the rapid data transmission. When the hard disk is energized, the processor execute on-chip Loader code, which will load and execute the Boot ROM to the cache (for the embedded processor, this is the internal storage). Boot ROM may be stored at on-chip FLASH in the main control, independent I2C EEPROM, SPI FLASH chip or NAND FLASH array in solid state disk. 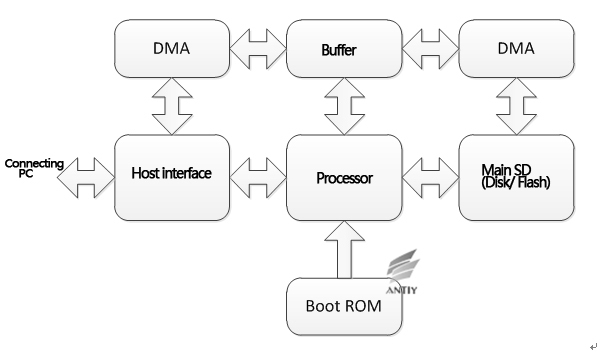 After getting the control right, Boot ROM will initialize the basic device and the main storage medium, load the firmware’s main body from the main storage medium, start the driver module of IDE/SATA bus interface, and entry standby state, at this time the computer can operate the hard disk. 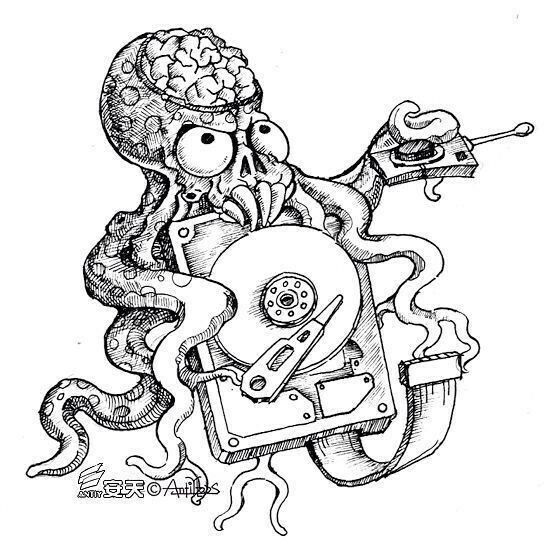 For the most mechanical hard disks, the main parts of their firmwares are normally stored in the hidden sector of the disk, and after initializing the head assembly according to the calibration data, Boot ROM reads the firmware data from the hidden sector and transfers the control right to the firmware’s main body, and after the main body is initialized with itself, the bus interface driver module is loaded and executed. So far, the hard disk finishes the power-on starting procedure. With the hard disk’s data stored on the disk platter, when the hard disk is under the working state, the principal axis drives the platter to rotate in high speed, and the read-write head suspends several microns on the top of the platter and conducted through the giant magnetoresistance effect. The transmission arm makes track seeking with the help of the voice coil motor composed of the strong magnet and the coil to locate the read-write content. In the figure, this countertorque spring device is used to provide the restoring force for the transmission arm, and can ensure that the head is put automatically to Park area in the case of the hard disk’s power outage. In the Park area, there is a soft supporting device, which can read and write the arm to avoid the platter crash due to the outside shock when the hard disk is not working. 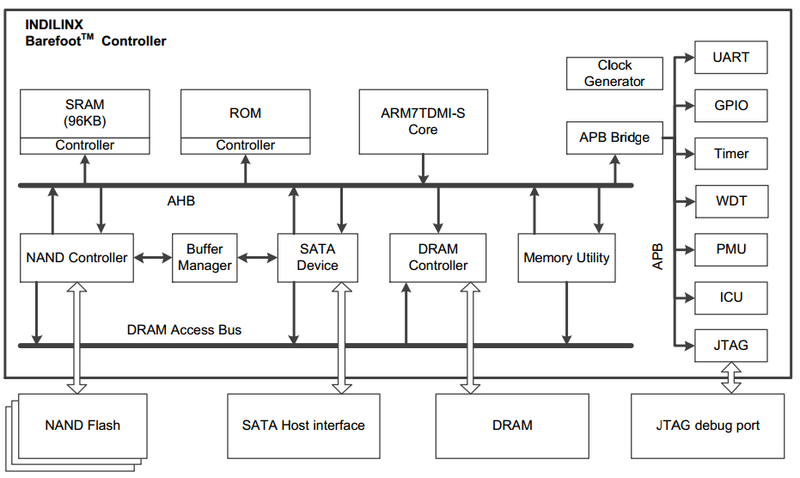 In the figure, the left frame refers to the controller of solid state disk, and the right refers to the onboard device and NAND FLASH array, and some controllers also need the external Data Buffer RAM, i.e. the cache. Seen from the figure, the controller itself can form a complete computer system, of which boot process is similar with the mechanical hard disk, so we don’t repeat it here. 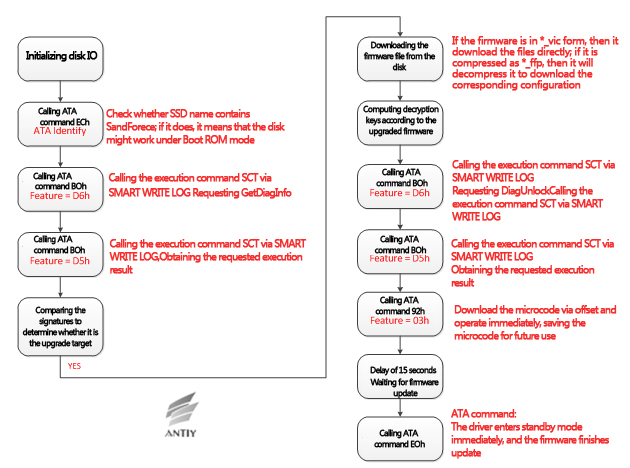 As the current common IDE and SATA disks follow ATA instruction set, the PC machine makes the read-write operation by delivering ATA commands. ATA technology is a technical specification family about IDE（Integrated Device Electronics）. Originally, IDE was just a hard disk interface technology which intended mainly to combine the controller with the disk body. As IDE/EIDE is more and more widely used, all technologies used by this interface are summarized as the global hard disk standards by the global standardized agreement, so this created ATA（Advanced Technology Attachment）. So far, ATA has been modified and upgraded for several times, and the interface of each edition is based on the previous one and maintains the backward compatibility. In addition to the read-write command, the hard disk also is available to some high level functions, such as the self-monitoring function（SMART）, capability setting （HPA）,and acoustic management（AAS）. See“ATA/ATAPI Command Set – 2 (ACS-2)”(An standard document with 500 pages). mware and remediate the defect on the user system through the software tools, for example, in December 2008, when a failure existed on Seagate hard disk, the firmware update tool and instruction were released officially to allow users to refresh new firmware solutions. Another similar case is C1 event of Western Digital. This mechanism which upgrades the firmware in the system through host software is very convenient, which also means that the possibility that the firmware is changed maliciously exists. This malicious change can be operated through software without you knowing it. As described in the previous section, the hard disk itself is a complete embedded system, which internal firmware runs independent of computer’s firmware. The firmware controls completely the read-write operation of the hard disk, and even processes the data independently without the permission of the host. If the attacker designs the smart codes in the hard disk’s firmware, it can intercept and disturb the read-write operation of the user, or obtain the highest control right of the system. All of these operations are completed on the hard disk, so the user and the soft and hardware can’t percept the process and even stop these operations. Taking the Jasmine development board in the OpenSSD project as an example (An open-source hard disk project with a research purpose), if the attacker understands totally the structure of the hard disk’s controller, including the address space, this attacker can intercept some certain behaviors of the controller through the carefully constructed firmware, and modified the data in the DRAM during the process of the data transmission. For example, intercepting the ATA read-write command 20h, when reading the specified sector, the attacker tampers with the data in the DRAM to make the data discrepancy between the computer obtained and at the hard disk so that to remain its destruction after the system re-installment and the low level format. The information about Equation Group appeared on February 16, two days before the Spring Festival. Time makes us think of Slammer worm appeared on December 23 Lunar New Year, 2003, Sasser worm on May 1, 2004, and the Shellshock before National Day 2014. These events impact our emergency speed, while Equation Group tests our comprehensive reserve and ability depth, and the analysis. For Antiy team, this is the first time to get anxious when issuing an analysis report. In 2003, we were eager to issue the Dvldr analysis report to offer the solution for users quickly; issued the Stuxnet analysis report blindly when we though the effort was enough; and issued the Flame analysis report indulgently in a relay way. But this time, we are blocked due to the disk firmware but not encryption, driving and hidden problems. In the term of the attacker with a long-term preparation, the key of understanding the situation for the defender is rely on the manpower and time. We have paid attention to the embedded firmware very early, but when the threat really appeared, we found the rival was more sophisticated and stronger. We also get extremely worried that the reports of related events are deviating from the core theme. Many users have asked us “whether all disks have been put into Trojan horse. With the hardware and software system development, it is an inevitable trend that the updatable mechanism is achieved for the hardware device’s firmware, and this mechanism itself can’t be called as the backdoor. According to the current analysis results from Antiy, partners and organizations, in the related attacks the writing firmware operation occurs when the leading malicious code sends the host information back and when it is judged the valuable object——that is a high conditional intrusion behavior. Through the long-term analysis and research, the attacker can achieve independently the related mechanism without intruding the vendor to obtain the technology paper. The writing firmware operation is used to implement the latency and persistence, but the upper operation ability still exists on the host system, obtaining the other operation modules through the network. In the view of the previous behaviors of the related countries, there are reasons to doubt that the same component may be used to the logistics chain hijack, i.e. injecting it during the processes of specified objects determination and the host or disk repair. But based on its operations and risk analysis, we believe that the batch operations will not be conducted, according to the operation method of Bootkit+firmware. As the Bruce Schneier warned that “more and more tactical behaviors are used widely in the cyberspace”, and upon the exposure of new methods, the enlightenment effect will be created for hackers so that to encourage the threats. The related attacks really embody some security blind sports, for example, whether the signature verification mechanism is adopted by the disk’s firmware and written to the firmware at the same time. At present, we have no found the low-cost and unconditional interface for reading. Similar deigns make some difficulties for security analysts to implement detection and verification actions. The plan for defensive positions must not depend on imagining the rival. To view the security and development relation in the objective way, to conduct the depth and specific analysis for threats and to study and judge the strategies and paths of rivals, always are our critical points responding to threats.